Finding a good material law can sometimes be a daunting task even for experienced users. 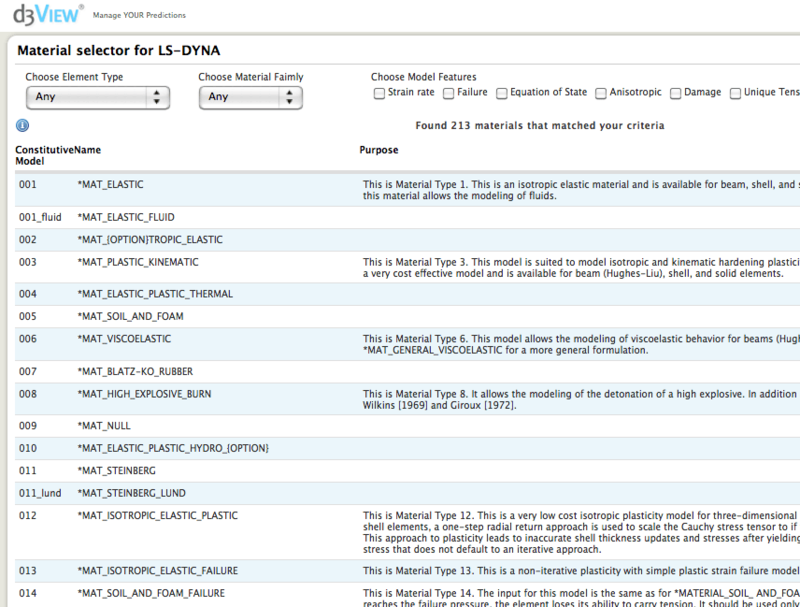 To facilitate a quick review of possible material laws for a given material criteria, a LS-DYNA Material Law Browser was created for personal use and I hope its useful for others. Very nice. I think a benefit would be the ability to create an open database, where contributers can upload material model coefficients (with descriptions and references). I have also worked with Ansys Autodyn and the material library present there is a valuable addition to the software package. Do you think this is a future possility with the LS-DYNA Material Selector? Yes, there will be soon an interface that will guide the user to characterize the material. The backend is completed for a selected number of materials and the UI will be developed for them. Depending on the class of material and the chosen constitutive material law, the wizard will guide the user to characterize the material depending on the availability of the test data. I cannot open the theory of the selected material.